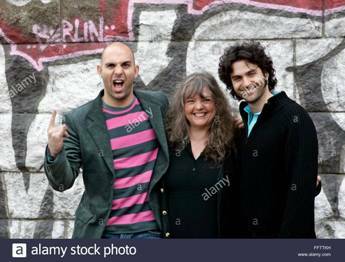 Ahmet and Dweezil Zappa with their Mom, Gail, in happier times? When adult siblings are continually at one another's throats, the conflicts have often been set up, either openly or covertly, by the behavior of one or both of the parents over an extended period of time - usually dating back to the siblings' childhood. Such parental behaviors are particularly effective for this purpose if started when the children were very young and have been continued, with minor variations, throughout their lives. There are a number of relatively straightforward techniques for parents to accomplish this goal. Here are a few common ones; there are undoubtedly a whole lot more. 1. The parent gossips and complains about each sibling behind that sibling's back to the all the rest of the other siblings. 2. The parents make constant negative comparisons of one sibling with another. For example, they might repeatedly scream, "Why can't you be more like your brother?!?" 3. The parent consistantly focuses only on those siblings who are creating repetitive, ongoing problems for themselves - and for everyone else in the family - and pays no or minimal attention to the siblings who are doing well and who are functioning independently. 4. Parents may leave the bulk of their estate to one or two siblings after they pass away, and much less - or even a pittance - to the rest. This is especially effective if they give almost all the money to the biggest screw up, or to the ones that did not come over and help take care of them when they were sick or indisposed in some way. The picture at the top of the post are musician Frank Zappa's wife Gail and his two sons, Ahmet and Dweezil. Although there is no way to be certain from news stories orTwitter wars, a recent public feud in the family might possibly be an example of what I'm talking about. "Frank Zappa’s rich musical and cultural legacy, and which children have a right to profit off it, have recently become the subject of a public and contentious family battle. The children of Frank and Gail Zappa – Moon Unit, Dweezil, Ahmet and Diva – were left unequal shares of the Zappa Family Trust, which owns the rights to a massive trove of music and other creative output by the songwriter, filmmaker and producer — more than 60 albums were released during Zappa’s lifetime and 40 posthumously. Thanks to a decision by their mother, who died in 2015, Ahmet, 42, and his younger sister, Diva, 36, share control of the trust — to the dismay and anger of their two older siblings, Dweezil, 46, and Moon, 48, who received smaller portions." Why do parents do this? How do you get the parents to recognize they are doing this and stop? Actually, I think they do recognize they do this, but in fact, do it purposely (maybe subconsciously) and react with denial when approached with the topic or blatant facts that prove they are guilty of doing this. What drives this dysfunction? The "biggest screw ups" are reveling in the extreme attention, money, gifts, support, etc. and understandably would never want to speak up to what is happening for fear of losing everything, while the "non-screw-up" responsible children are hurt, jealous, dumbfounded and driven crazy by the injustice of it all and dismissed with statements such as "get over it" or outright denial. It seems as though the parents form alliances with the greediest children, while pushing the loving, sincere, generous, caring ones away... my other thought is that the parent creates jealousy between the two siblings as a passive aggressive way to incite anger from the "non-screw-up" towards the "screw-up" in an attempt to distance themselves from the "non-screw-up" without having to take the blame for doing so. The "screw-up" then becomes the hated one. It is very confusing. The reasons why parents do this vary, but IMO, boil down in most cases to the parent's own internal conflicts (stemming from mixed messages from their own parents) over such things as their roles in work, marriage, and/or parenting. One child will be induced to act out one side of the conflict while the other acts out the opposite side. They then may fight with each other - reproducing the parent's internal struggle - which the parents then live through vicariously.